New year, new anime! Get your 2017 started off on a high note with Sentai Filmwork’s January slate, featuring the much-anticipated Infinite Stratos 2 Premium Box Set. Check out the Sentai Shop for more information and pricing. Get a special offer when you pre-order our January titles from the Sentai Shop. From now until Friday, September 30, 2016, get free shipping on all pre-orders in our January collection. Additionally, the first 100 fans who pre-order Beautiful Bones -Sakurako’s Investigation- will receive a secret mystery gift with their order. SYNOPSIS: Keima Katsuragi's skill at winning women's hearts is so legendary that he's called The God Of Conquests, but that's only in dating video games, not the real world. Suddenly, Keima's life takes a turn for the weird when he answers what he thinks is an online gaming challenge. Instead, he ends up with a demon contract, and now he has to help perky demon hunter Elsie track down a bunch of demons that have escaped from hell! The reason: the demons have hidden themselves within the hearts of a group of random girls, and the only way to get them out is if Keima can make the girls fall in love with him. Also, just to make sure that Keima is properly incentivized, his failure will result in the loss of something important: his head! Hopefully, the tricks Keima's mastered with virtual girls will work just as well with live ones. Otherwise, things are going to get really messy in the spectacular ultimate collection of THE WORLD GOD ONLY KNOWS! SYNOPSIS: Shotaro Tatewaki knows that Sakurako Kujo isn't a normal person. After all, most young women have multiple interests revolving around things like work, fashion, and sports, but Sakurako is fixated on just one thing: bones. While she already has a huge collection of them, mostly animal, she's always trying to gather more, especially those of the human variety. This can be quite a problem for Shotaro: especially since he and Sakurako have a positively unnatural aptitude for discovering dead bodies together. Fortunately, Sakurako is a naturally brilliant detective who unearths the mystery of what happened to the owners of those bones, but it's up to Shotaro to make apologies for Sakurako's odd quirks and tendency to make off with the evidence. It's a grave business that can leave him literally bone-tired, but for the wheels of justice to turn, there are always more skeletons to be bared and new secrets to be exhumed in BEAUTIFUL BONES - SAKURAKO'S INVESTIGATION -. SYNOPSIS: There are probably worse things that could have happened to Ichika Orimura than being the only guy in a training academy filled with military hardware and several battalions of highly competitive and extremely boy-crazed teenage girls. And being caught in a five-girl crossfire between his obsessive childhood friends Lingyin and Houki and the even more zealous British, German and French pilots Cecillia, Laura and Charlotte, at least turned out to be survivable. But surely, Ichika's finally put all his female troubles behind him, right? Oh don't be ridiculous. None of the femmes fatales in his life have canceled their conquest scenarios; there's double trouble arriving in the form of the Sarashiki sisters; the rest of the school is still waiting in line to take their shot; and when a whole new set of female pilots working for the bad guys shows up with a new generation of stolen IS hardware, things are about to get utterly lethal! 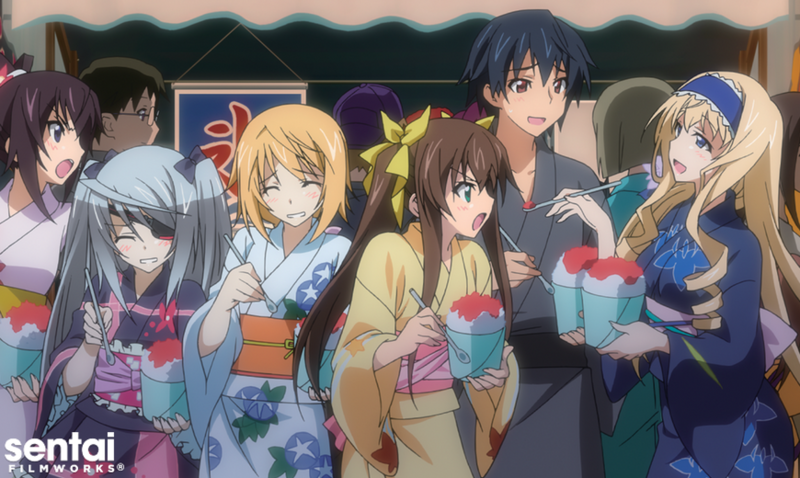 The mayhem continues, the mecha runs amok, the hormones run wild and the maiden's behavior becomes even less maidenly as Ichika gets schooled for a second spectacular semester in INFINITE STRATOS 2! SYNOPSIS: Our society is infected with a disease, a gangrenous cancer in the form of those who commit the most monstrous of evils, yet whose power and influence place them beyond the reach of the law. When corrupt politicians fail to act and the police seem helpless, there is a third, secret option that stands ready to excise the malignancy in a tactical surgical strike: Black Label, a dedicated team of doctors, nurses, and students who moonlight as an elite team of assassins. With the world's deadliest nurse, a master swordswoman MD, an idol with an affinity for explosives, and a pair of seemingly indestructible high school students, their mission is as simple as it is deadly: identify the drug runners, terrorists, and criminal masterminds who can't be destroyed any other way, and then eliminate them by whatever means necessary in TRIAGE X! SYNOPSIS: Illyasviel von Einzbern's life has become ridiculously complicated since the Kaleidostick Ruby convinced her to become a magical girl and join the quest for collecting the seven Class Cards. Since then, almost every day has brought a new surprise, from gaining new friends and partners like Miyu Edelfelt, to encountering her own magical twin! One would think Illya deserves a little time off, right? No such luck: a trip to the beach quickly turns into a magical quest, and Illya finds herself caught in a string of magical feuds, encounters with love potions, an excursion into the world of "boys love" comics (plus the women who read them), and half a dozen other delirious diversions. However, that's only the warm-up for what might be her final mission: recovering the long-lost Eighth Card! It's a mystical whirlwind of unexpected escapades and surprising new revelations as Illya's saga continues in FATE/KALEID LINER PRISMA ILLYA 2WEI! HERZ! Which of your favorites are you finally adding to your collection?